The problems and divides we see every day seem too big to solve. Politicians enrage us to fight. News media sensationalizes the worst extremes. And they all do this so well that we can't help but feel angry and disenchanted. 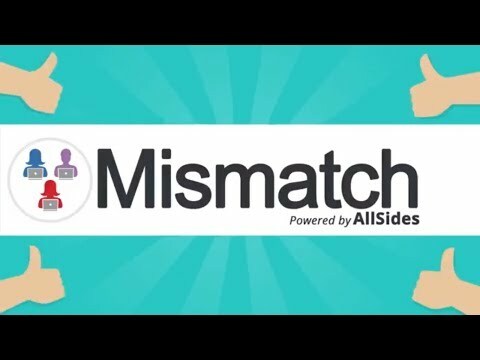 Enter Mismatch, a program by AllSides. We pair you with your political opposite so you can have a respectful conversation about hot-button issues. The program, a part of AllSidesForSchools, targets students in middle school through college who want to challenge the polarized political climate and learn how to discuss difficult topics across divides. It will soon be available for all adults. Recently featured on the front page of the San Francisco Chronicle, AllSides CEO John Gable weighed in on the technological issues contributing to the hyper-partisan atmosphere we see today. “The internet is becoming so one-sided that when it comes to political and controversial issues, we have less access to different points of view today than 20 or 30 years ago,” he said. Check out Mismatch.org to find your perfect mismatch, and read the Chronicle article on Mismatch to get an inside look at this program.